The Sports & Performing Arts Injury Clinic are now part of the Össur Private Referral Patients Pathway and can fit and supply specialist Össur braces for Osteoarthritis, knee injuries or protective sports knee braces for people living in north Cumbria, to Central Scotland and the North East. Whilst you may not have heard the name, you are more than likely aware of some of their products, because Össur are the manufacturers behind the famous running blades of various athletes. At Össur, Life Without Limitations is more than just a slogan; it has been a passion for close to forty years. A global leader in orthopaedics, the Company employs the smartest minds and the most advanced technologies to help change lives. The end result is award-winning prosthetics, compression therapies, bracing and supports that make a real difference to people’s mobility. Always at the forefront of innovation, delivering a wide range of products and services, Össur’s reputation has been built on scientifically-proven designs with the emphasis on clinical outcomes. Topping the list of Össur’s core areas of expertise are silicone and carbon composites. This specialist materials know-how also extends to textiles, particularly those used in compression therapy and in the last decade, Össur’s accumulated skills and knowledge have produced cutting edge bionic technology, arguably the most significant advance to date in the international orthopaedic arena. A long-standing and dynamic relationship with medical professionals and product users, plus sustained investment in research and new technology, continues to produce some of the most effective, non-invasive mobility solutions on the market today. For many consultant knee surgeons the Össur knee braces are their first choice, with the Unloader One offering many of the benefits of knee surgery without the invasive technique and may be used by consultants to find out if a patient will be responsive to surgical procedures such as High Tibial Osteotomy. Injured knee ligaments will never repair to their pre-injury status, so prevention is better than cure. 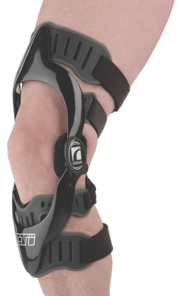 The Össur CTi® Custom Ligament Braces are designed to support the injured knee. Many extreme sports place the knee at high risk of injury and the CTi® custom knee brace has become the first choice for stability and protection. With a unique range of “add on” devices, these braces can be customised to suit many sports. 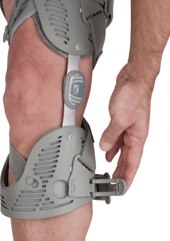 CTi® OA – Add varus or valgus correction to this classic and you have an excellent, dual-hinged hybrid OA and ligament knee brace for more active patients.